The Best Fourth of July. Ever. Beyond fireworks, the Fourth of July is a holiday beloved by Americans because of the glorious food associated with this grand day. Smack in the middle of summer, the Fourth is the perfect opportunity to bust out the grill and impress your friends and family with some fancy cooking. 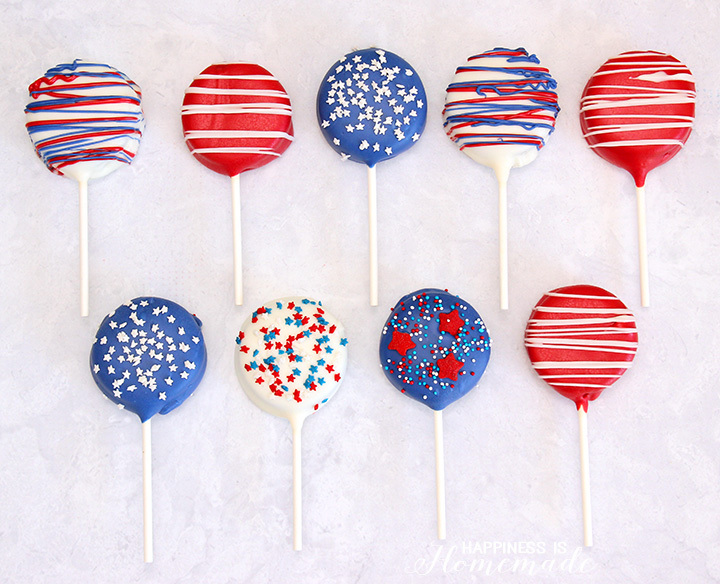 Today we’re featuring some of our favorite food, activities, and decor for the perfect Fourth of July celebration. Let’s start out with the most important item on the agenda: food. The Fourth is a holiday where Americans momentarily part with their diets and restrictions and indulge in outrageously decadent summer food. You could say it’s very much like Thanksgiving in that way. 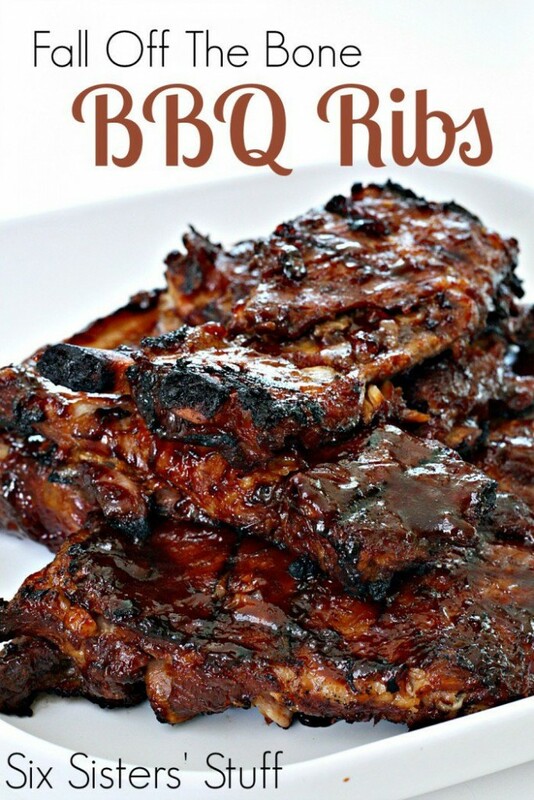 By far the most popular Fourth of July menu option is BBQ. You can keep it as simple or complicated as you like. Most people with kids opt for burgers and hotdogs, but if you’re feeling a bit more ambitious we recommend these Fall Off the Bone BBQ Ribs. What is interesting about these ribs is that they tenderize all day long in a slow-cooker and then get nice and charred on the grill after. 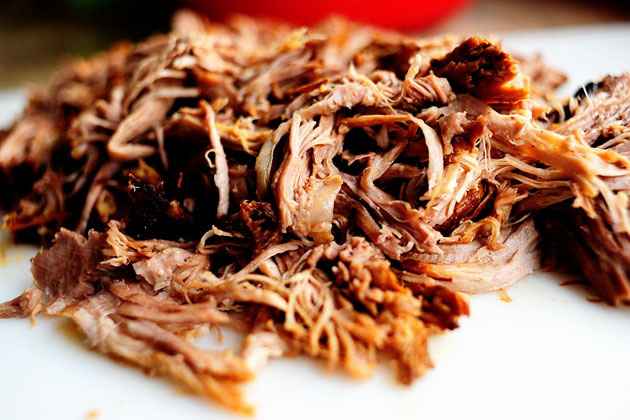 If you have a lot of mouths to feed and don’t want to slave away over a hot grill this recipe for Spicy Dr. Pepper Pulled Pork is a dream. Cooked in a Dutch Oven or crock pot, this meal serves up to 18 people! Eat it in a sandwich, taco, or by itself, you can satisfy that BBQ craving without even turning on the grill. 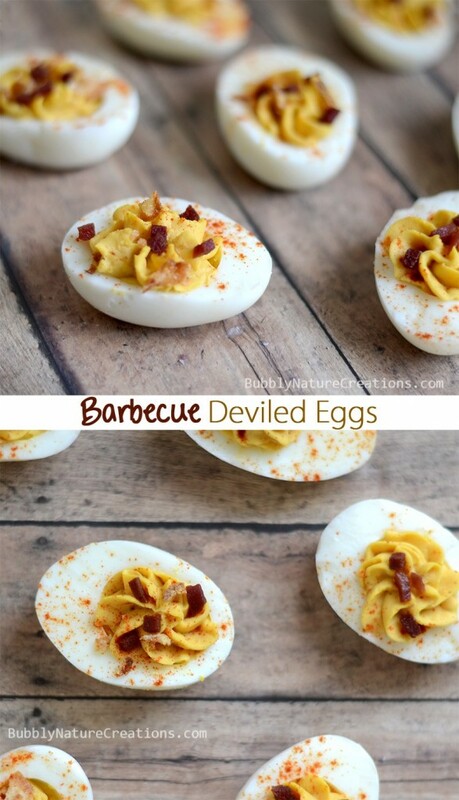 An excellent and easy side dish to serve are BBQ Deviled Eggs. This recipe combines two of the most glorious foods–BBQ and deviled eggs. You’ll need to make about twice as many as you *think* you’ll need. They are sure to go fast! 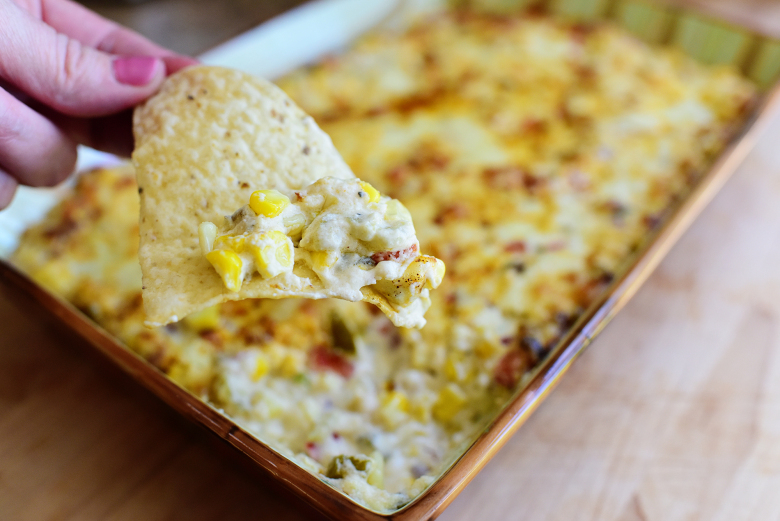 If you want to give your guests something to talk about long after the Fourth is over, check out this recipe for Hot Corn Dip. This is one of those foods that I know without even tasting it would be like Kryptonite for me. If you have stronger will power than me, I beg you to make it. I want to spend the Fourth knowing that somewhere out there, there are people indulging in this heavenly dish. I just don’t think I can be one of them *sob. Let’s move along to the sweeter side of things, shall we? We recommend you keep desserts simple and transportable as they will be most likely be consumed around the time you watch the fireworks show. Like the idea of making something that is both salty and sweet? 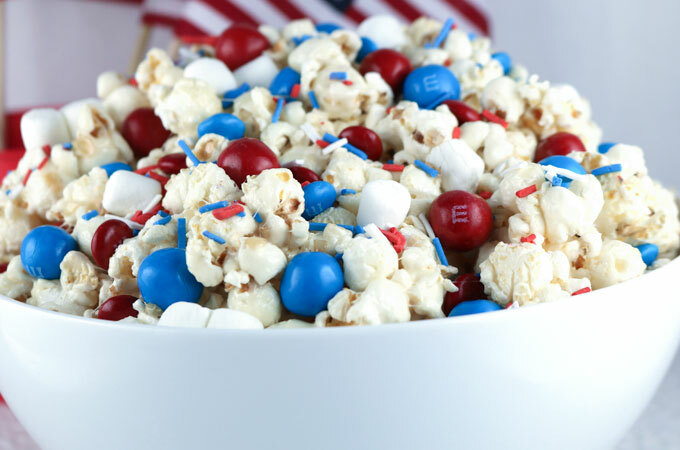 Check out this Patriotic Popcorn which combines popcorn, marshmallows, M’n’Ms and Pretzel M’n’Ms. To die for! Another sweet and simple dessert idea are these cheesecake bites from The Kitchen is My Playground. 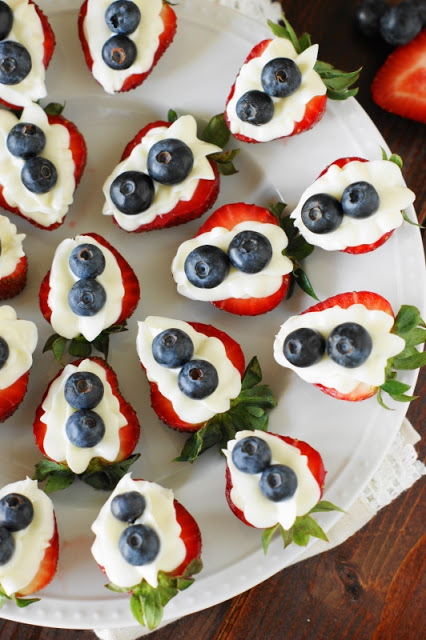 Red, white, blue and just a hint of healthy these are great for adults and kids alike. The cheesecake base is a simple concoction of confectioner’s sugar, cream cheese, and almond extract. A super simple recipe, this is one that you can let your kids “help” with by lining up blueberries. Finally, if you want to really dazzle your younger crowd and please the adults chocolate dipped Oreos are the way to go. Slide them onto a stick and you have Oreo Pops! These are sure to be a crowd pleaser and while they may look intimidating–they are a cinch to make. If you’re like me, and are a parent to small children, you know that a day long event that leads up to fireworks is going to have your kids antsy. “Mom, when is it time for fireworks?” “Mom! Can we do fireworks now?” “Mom! Is it time for the fireworks to start yet?” I have found that the easiest way to field these questions is to have plenty of activities to keep them busy. After all, I want to spend the day enjoying friends and family, not getting irritated by my very persistent five-year-old. Another simple but fun activity for kids is to have a chalk-work fireworks challenge. My kids perk up to anything with the word “challenge” attached to it. 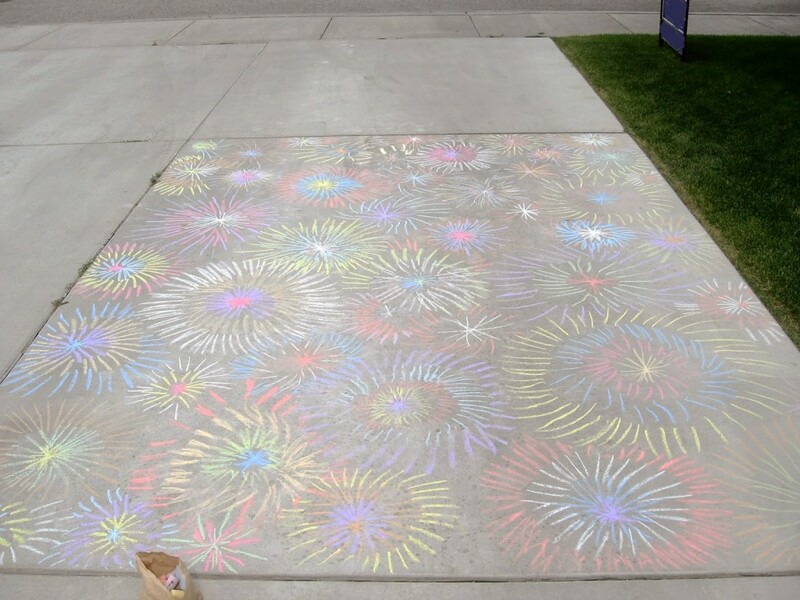 “Bet you can’t fill the whole driveway up with chalk fireworks!” That’s all it would take to send my two kids out for a solid hour of chalk-work fun. For an activity that might require a *little* adult supervision/help, check out this fun fireworks craft that incorporates salt, glue, and food color for a 3-dimensional result. Now, this last activity will DEFINITELY require adult supervision, but this will be the thing they talk about and remember for years to come. 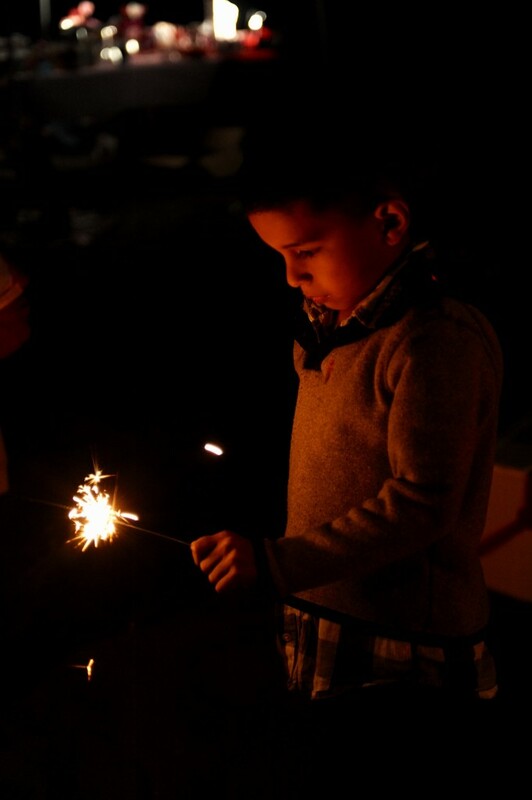 Our color sparklers are 10″ long and burn for about 40 seconds. These are guaranteed to make your kid squeal with glee. 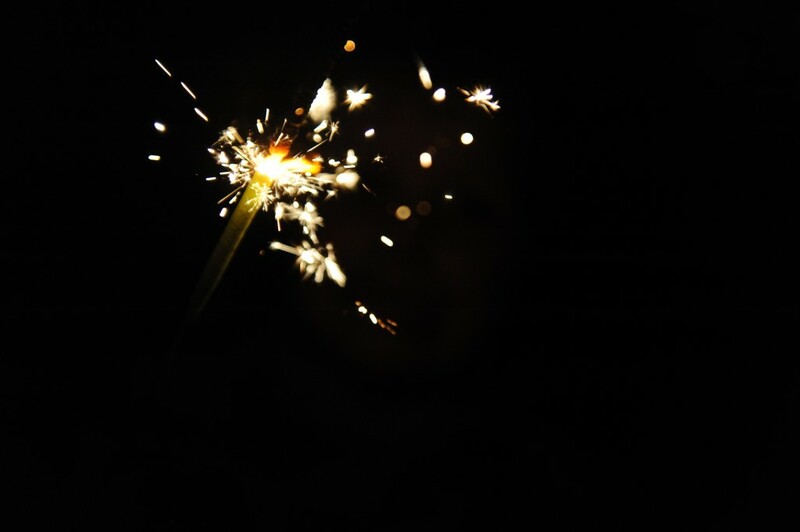 If you want to have a longer-lasting effect then we suggest the 20″ wedding sparklers. Don’t let the word “wedding” deter you. These babies will burn for 120 seconds and will absolutely mesmerize your kids! 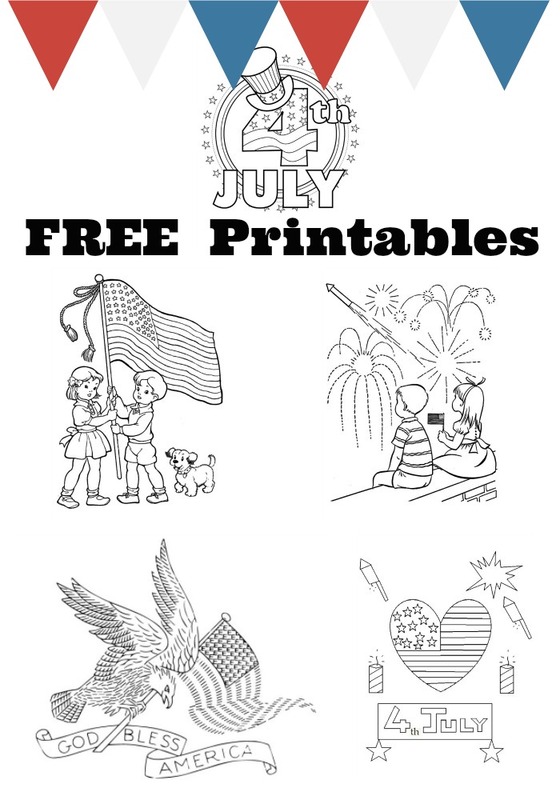 We also have patriotic LED foam sticks, patriotic glow sticks, necklaces, and bracelets for your kids to enjoy while they watch the fireworks show. I like these items because they help me locate my kids in the dark and my kids get a huge kick out them! 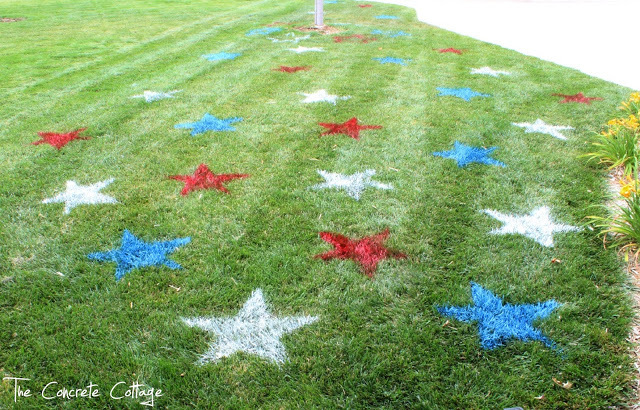 It doesn’t take much to spruce up your house or yard for July Fourth entertaining. A few flags here, a couple stars there and BAM! You’re Uncle Sam approved. However, should you want to go the extra mile we have found a few ideas that deliver big with minimal effort. That’s right, you can totally paint your lawn. I know my kids would flip a lid if we did this. They would also probably think that its totally ok to paint the lawn whenever they want to…so make sure you communicate that this is a once-a-year kind of thing. While you have the spray paint out for your lawn you can easily whip up this adorable mantel look. Jars, twigs, and spray paint oh my! It’s so easy it’s ridiculous. These would also be very cute as centerpieces. 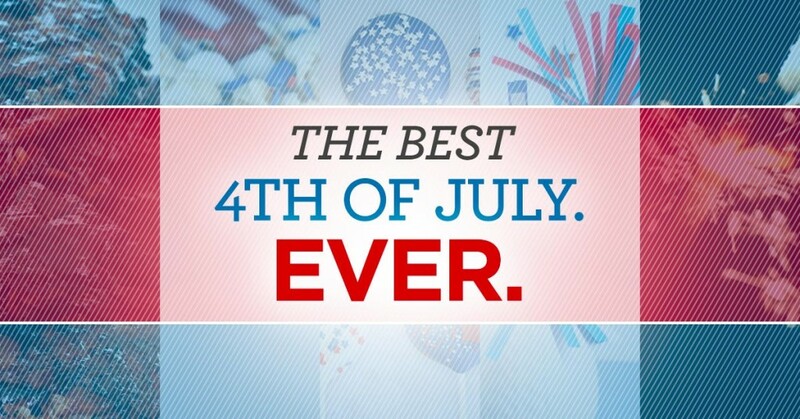 We have a special place in our heart for anything fireworks related. 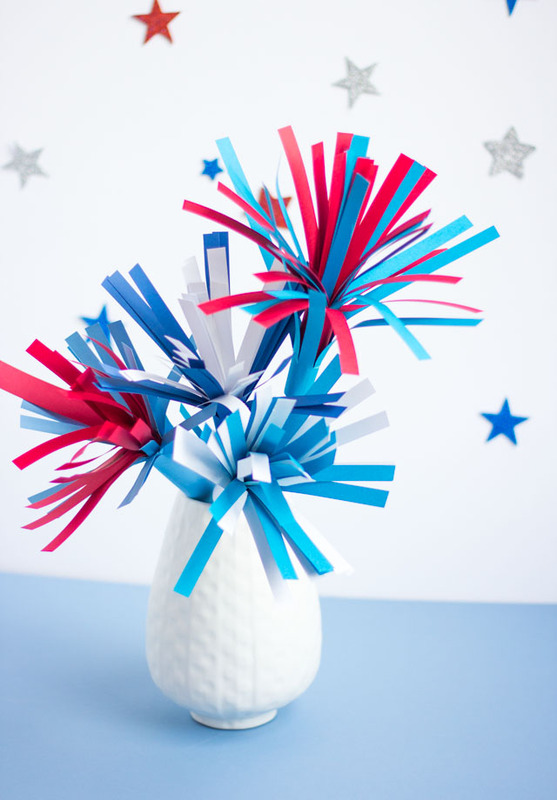 This adorable paper fireworks centerpiece is perfect in every way. The best thing about this decor piece is that it’s just paper and straws! How easy is that? We could go on and on, but as you can see the possibilities are endless when it comes to your July 4th celebration. We hope you walk away inspired and ready to make this Fourth of July the best one yet!